Hemel Town boss Joe Denney says his men will be well-prepared for their historic FA Trophy tie against big favourites from the National League at the weekend. High-flying National League side Solihull Moors will be the visitors at Vauxhall Road this Saturday for the huge last-16 clash – the furthest the Tudors have ever reached in the premier non-league cup competition. The winners will be just two wins away from a date at Wembley Stadium. Solihull Moors are in third place in the higher National League and just three points off automatic promotion to League Two. The West Midlanders come into this fixture having lost only once in seven outings, while their away record is four wins, two losses and two draws in their last eight. Hemel on the other hand won for the first time in three league outings on Saturday when they beat Hungerford Town 3-0 on the road. 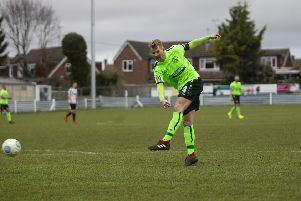 Tudors’ manager Joe Deeney was delighted with what he described as an “excellent team performance” at struggling Hungerford. It will be a tough ask for the Tudors but they did beat National League opposition in the Trophy first round at Vauxhall Road when they outlasted Eastleigh 2-1. Deeney pointed out that his men go into every game expecting to win – and this tie will be no different. The players are looking forward to the challenge, he added.